Wow, this has been a fun pattern to start, although a little tricky, although I do like to make life complicated for myself! I'm making a bag, so the material I happen to be using hasn't been the best for my usual pattern transfer method, I also wanted to applique the octopus and although I did manage to do it, put it this way, the octopus you see there in my hoop, that's octopus number 2. So if you're new to applique, personally I wouldn't try appliquing this pattern, you may end up lopping a few tentacles off, like I did with octopus number 1! If I were using a different material than this slightly embroidery unfriendly blue material I'm using, to make the octopus a different colour I would have probably have used crayon tinting (see here for a great crayon tinting tutorial from Aimee Ray). 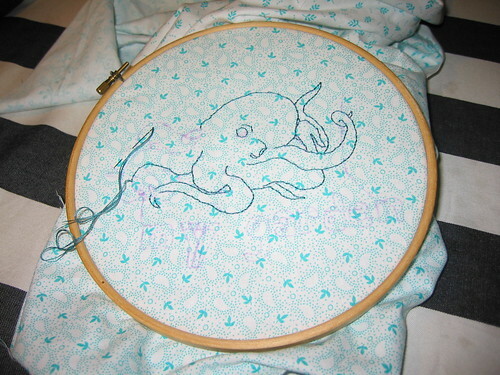 Anyway, as you can probably see if you squint real hard at the picture, I'm using backstitch to embroider my octopus, if you're new to backstitch you can find a great video tutorial on how to do the stitch, by Mary Corbet here. 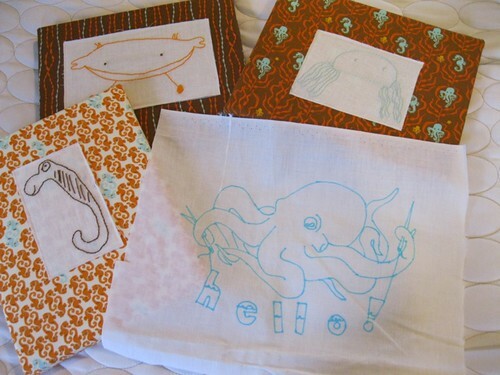 Meanwhile, fellow octopi are slowly swimming there way into the Embroidery pool, birdseyedavis gets top marks for getting in there first, with the plan for a new addition to the collection of sea-themed creatures in her kids' bathroom. and then there's lynnefloor, who is wondering what word to stitch under her octopus. I'm looking forward to seeing more octopi in the pool over the coming month, don't forget, you can find this lovely pattern by Corvus Tristis in this post here. I went to the linked post to get the pattern PDF, but the PDF's page was blank. Help? WV: metrof: "What?!! Metrof for dinner again??!!"